Super-mosques are a bad idea but smaller and more proportional places of worships are OK, UKIP leader Nigel Farage said during a visit to an English constituency recently wracked by accusations of a Tory race plot. Farage was speaking during a visit to Dudley North in the Midlands, where there are plans to build a large mosque with an 18-foot high minaret. Last month Afzal Amin, the Conservative Party candidate for the area, stepped down after being accused of deliberately stirring up racial tensions. Amin allegedly tried to recruit the far-right English Defence League (EDL) to hold a protest over the mosque’s construction – providing him a political point-scoring opportunity whereby he could step in and defuse the situation. Speaking to an audience of military veterans, Farage used the visit to launch his party’s defense policy – including UKIP’s commitment to the 2 percent of GDP required of NATO members. Pressed for his opinion on the mosque, Farage told The Guardian: “People need places of religious worship. It’s just a question of whether that scale is the right one or not. “I personally don’t necessarily think it’s a great idea. 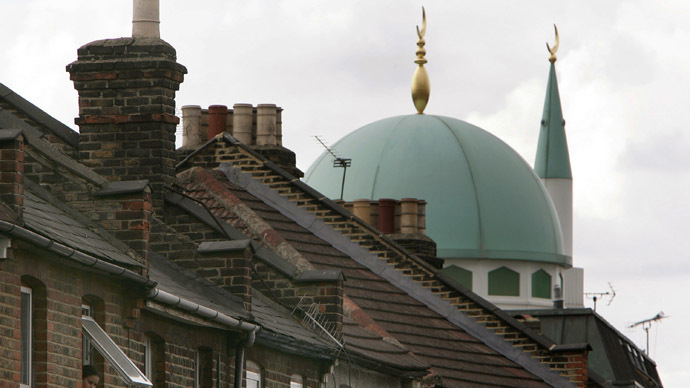 I would rather see more smaller and proportionate mosques would be my own personal feeling,” Farage said. In the past UKIP members have struggled to differentiate religious buildings from each other. Last year, a Kent branch of the populist right-wing party was left red-faced on social media after it mistook Westminster Catholic Cathedral, one of London’s most iconic buildings, for a mosque. Twitter users were quick to point out the branch’s error.